Design Smart. Build Green. 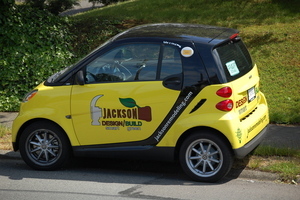 Efficient new vehicles demonstrate Jackson's commitment to green. David Johnston addresses the Jackson Remodeling team June 12, 2008. Jackson Remodeling has been doing green remodels since 2001, but until now have still remodeled with traditional methods and materials as well. No more. 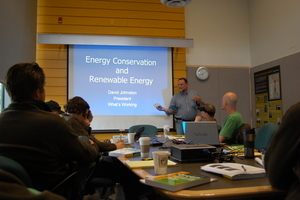 In June, Jackson announced that green will now be the only way they do business. Once they complete a few jobs already in design, the firm will simply not build with materials or methods unless they are sustainable, efficient, and healthy. The company marked their commitment by rolling out an updated logo, putting sales and design staff in new Smart Cars, and flying in national green building expert David Johnston to train and inspire the team in a private day-long training session.